Japanese Twitter user DB Hopelash has been taking stacks of Yu-Gi-Oh! 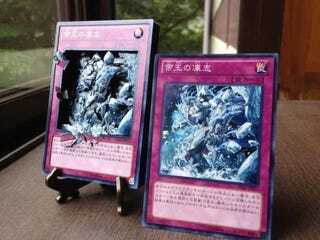 cards, cutting them out with a hobby knife, and making truly amazing shadowboxes. Imagine how patient you need to be. And here is a finished shadowbox. No wait. This is my favorite. Yes, that’s a mirror in the middle. Follow DB Hopelash on Twitter for more impressive creations.